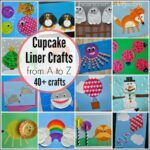 It’s been awhile since we’ve had the cupcake liners out for crafting and I almost forgot how much I adore them. 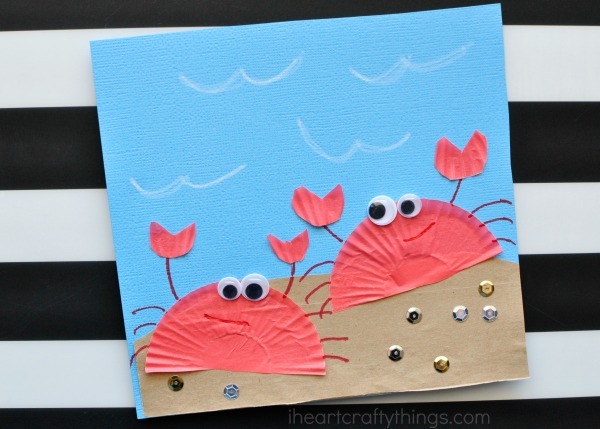 My love for them is renewed again after making this adorable cupcake liner crab craft for kids. 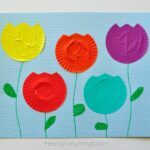 If you are looking for a simple afternoon craft to make with the kids that doesn’t require painting, this is it! 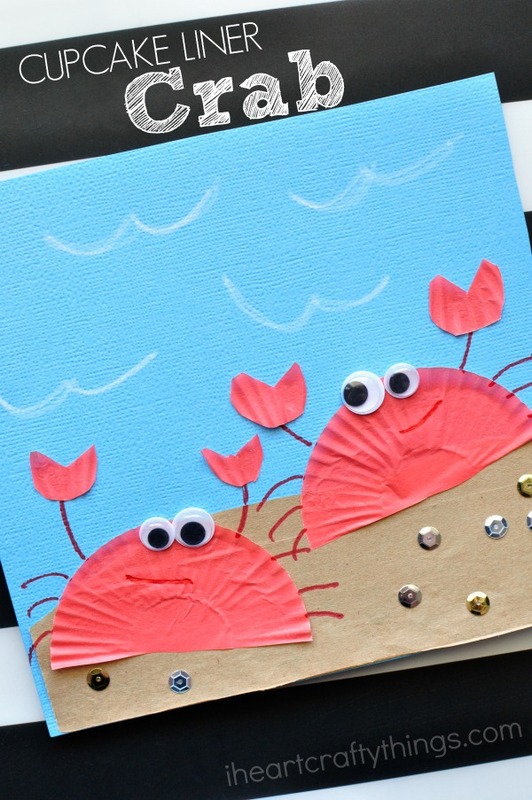 You could also combine our cupcake liner fish craft with these cute crabs and make a big ocean scene full of cupcake liner creatures. How fun! 1. (optional) Start by cutting your blue cardstock paper into a square about 8-inch x 8-inch. You don’t have to do this, but you might want to make more than two crabs if you leave it a full size paper. Cut off a piece of your brown paper lunch bag or tan paper and glue it onto the bottom of your blue paper to make sand. 2. Cut a mini red cupcake liner in half to make two crab. Glue them onto your blue paper with the curved edge on top. Use your red marker to draw the legs and a mouth onto your crab. 3. 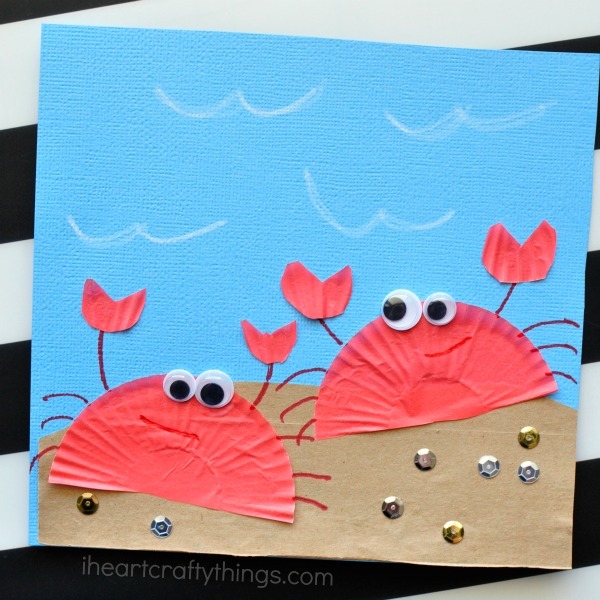 Cut out claws from another red cupcake liner and glue them onto your crab. 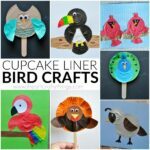 We found it easiest to fold another mini red cupcake liner in half, cut out the shape of a claw along the fold line, and then open that shape up and cut in half to get two claws. Now glue your googly eyes onto your crab. 4. (optional) Glue some silver and gold sequins onto your sand. We thought this looked like shiny rocks and sand at the bottom of the ocean. 5. Finish your cupcake liner crab craft by drawing wavy ocean lines in your water with your chalk marker or white crayon. These paper fish are colorful and super easy for kits to make. The added sequins give the fish great scale details. Turn a paper plate into an ocean theatre background and create a darling jellyfish puppet to dance around. Do..do..do…do..Grab some old newspaper and turn it into an awesome newspaper shark craft! Thanks for yet another great project idea! Thank you so much for the beach bucket. You r the best !